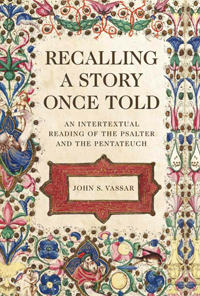 This book investigates the intertextual relationship between the Psalter and the Pentateuch. Intertextuality is a reading methodology that reveals various markers in the Psalter that guide the reader to the Pentateuch. The initial marker discerned guiding the reader from the Psalter to the Pentateuch is the five-fold division of the Psalter. This study then proceeds to examine the relationship between the initial psalm of each book of the Psalter and then exploring its relationship with a text from the five books of the Pentateuch. Psalm 1 is read alongside the book of Deuteronomy. Psalm 42 evokes the book of Numbers. Psalm 73 is read alongside the book of Leviticus. Psalm 90 is connected with the Book of Exodus and Psalm 107 is read alongside the book of Genesis. The conclusion of the study looks ahead at the implications of this reading of the text. This book is a sustained, close reading of these important sections of the Hebrew Bible. It will be helpful in any academic setting or as an introduction to either the Book of Psalms or the Pentateuch.